With the warm, long days of midsummer, we have the opportunity to explore new places and make the most of the great outdoors. Here are some local hotspots to check out this summer and create lasting memories with friends and family. Explore scenic hiking trails, a campground and a number of wildlife animals in our neighboring town of Byron. On select Tuesdays throughout the summer, the Dan Abraham Healthy Living Center Café will be hosting Tasty Tuesdays AND Music on the Patio. Enjoy live music + delicious food! To see the live music schedule for Music on the Patio, click the link above or visit dahlc.mayoclinic.org. All are welcome. With beautiful hiking trails, cave tours and interactive nature classes, you will have plenty to see and experience at Quarry Hill this summer and all year long! There is a variety of sports and leisure activities to participate in at Chester Woods. From kayaking to fishing to lounging on the beach, this location will not disappoint, especially for just $5 daily. Prep for the Heritage Classic with our 5k workshop on Thursday, June 30th from 12-1pm. Participants will receive a 5k training guide, nutrition information, tools for strength training and more. Heritage Classic is held on Sunday, Sept. 25th at Soldier's Field at 4pm. 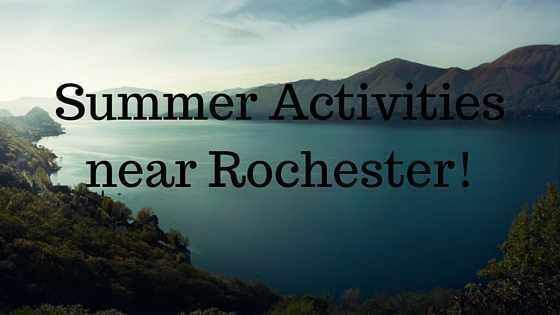 Use the Rochester Events website to find local events & activities. Catch a baseball game or a festival! These are merely a few of the exciting destinations to mark on your calendar for the summer. Have fun, and happy summer!